The embattled president said he'd be open to a summit with Donald Trump. Embattled Venezuelan President Nicolas Maduro has accused the U.S. government of trying to fabricate a crisis, which is "doomed to failure," in an attempt to start a war in South America. 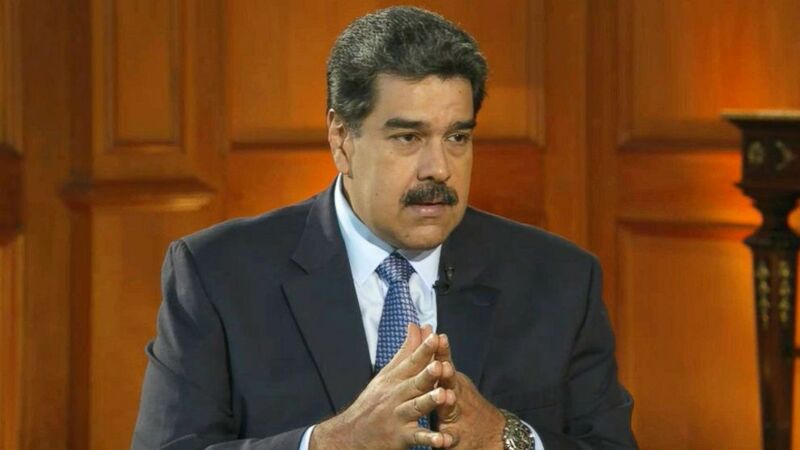 In his first interview with an American television network in years, Maduro said, "The extremist Ku Klux Klan government that Donald Trump directs wants a war over oil, and more than just oil," describing Venezuela as a "pacifist, humble nation." Tom Llamas: Thank you for you for granting us this interview, Mr. President. We do appreciate it. I do want to get to the news of the day, Vice President Mike Pence from United States met with Juan Guaido. Will you let Mr. Guaido back to Venezuela? Nicolas Maduro: Everything that the United States government has done has been doomed to failure. They are trying to fabricate a crisis to justify political escalation and a military intervention in Venezuela to bring a war to South America. Us using diplomacy have been anticipating all these attacks. This meeting in Bogota is a part of that policy to attempt to establish a parallel government in Venezuela outside of the constitution. When have we seen, in 200 years of relations between the United States and Venezuela, that the United States would decide without going through an election without a popular vote that in Venezuela there would be another president. When have we seen that? Never. I think this is extreme politics doomed to fail that nothing good comes out for the U.S. or Venezuela. Llamas: But I posed you the question, Will you allow Mr. Guaido back into Venezuela? 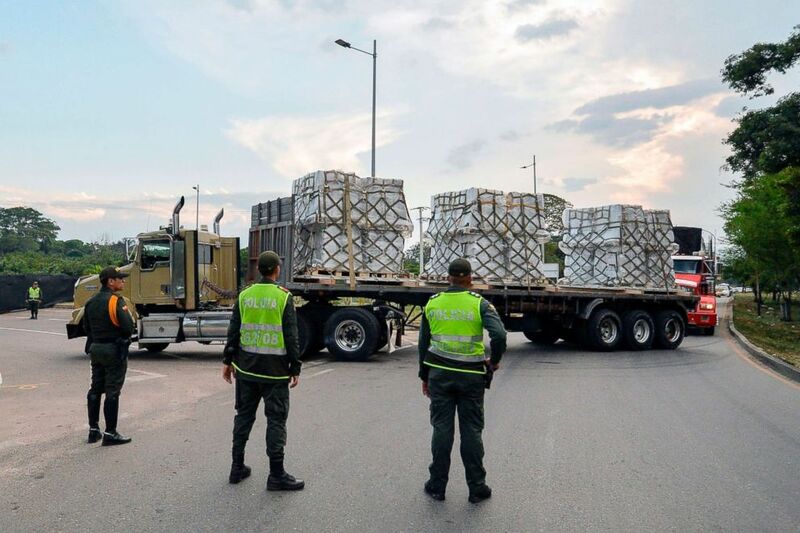 (Luis Robayo/AFP/Getty Images) Trucks loaded with humanitarian aid for Venezuela drive towards the Tienditas Bridge in Cucuta, Colombia, on the border with Tachira, Venezuela, Feb. 16, 2019. Maduro: He can come and go. He will have to face justice, and justice prohibited him from leaving the country. I will respect the laws. I'll ask you, does any U.S. citizen -- anyone, from Donald Trump to Barack Obama, are they above the law? If a court of law tells Donald Trump or Barack Obama they can't leave the country during a judicial investigation, would they leave? And if they were to violate the order and came back, what would the U.S. justice system do? Nothing more. Let everyone come to their own conclusions. Llamas: I'd like to ask you directly. Do you think Juan Guaido is a criminal? Will you arrest him? Maduro: It is not Nicolas Maduro who is in the position to arrest anybody in this country. I follow the rules of the law. The courts have their processes and they give orders to the executive branch -- that through the scientific police and the national police -- they take action every day in the face of different crimes against different criminals. No one can be above the law. In this case, Mr. Guaido has to answer before the Justice, not before Nicolas Maduro. Llamas: Juan Guaido is starting to use phrases that President Trump has used. He says all options are open when it comes to Venezuela. What does that mean to you? Maduro: That's a military threat. That's a threat for war. Llamas: You're talking about a military invasion. You think the U.S. wants to invade Venezuela? Maduro: The United States wants oil from Venezuela and is willing to go on a war for oil. The United States will not -- let me correct that -- and I apologize to the American people. The extremist government of the Ku Klux Klan that that directs Donald Trump wants a wants a war for oil. This is a war for oil -- and more than oil. Tom, you should know, because of the riches of our country. Look at what was just revealed in the book of Andrew McCabe. He just revealed that since 2017 Donald Trump in private meetings where he, McCabe, was witness, he would say that Venezuela has the oil and that Venezuela would be a good country for war. It's a crazy plan. It's an extremist plan. Because Venezuela is a pacifist, humble nation. Llamas: So you don't think this is about human rights -- you think this is about oil? (ABC News) Nicolas Maduro is pictured during an interview with ABC News on Feb. 25, 2019. Maduro: They always invent pretexts, always inventing excuses. To invade Iraq, they invented that there were weapons of mass destruction, and then it was embarrassment when it was known that it was all a lie; it was just an excuse for a pretext. Now about Venezuela they are constructing pretexts. The humanitarian crisis, the violation of human rights, the lack of democracy and supposedly to come to help the Venezuelan people they are going to send the Marines. They are going to bomb us, they are going to destroy the country. They are excuses for an escalation, a military invasion, that is why they say all options are on the table. This violates the Charter of the United Nations. Venezuela is a pacifist country. Venezuela is not a threat to the United States or to anyone in this world, and the problems of Venezuelans are our issues and must be solved only by Venezuelans. Llamas: President Trump has had some strong words for you. He has said you are not a Venezuelan patriot, you are a Cuban puppet, that you are a dictator, sir. Maduro: I do not know if Trump believes what is written for him for his speeches that he goes out and reads. Honestly, I am capable to give him the benefit of the doubt that he is repeating what is written for him. I think they are antiquated schemes from the Cold War. We should not return to the 20th Century of the old Cold War. Venezuela is a country with dignity. We are patriots, revolutionaries. We have an ideology, that of Simon Bolivar. Our movement came from the depths from the Venezuelan people. We've been governing democratically for 20 years. Everything that we are, everything that we have, we have because of the popular vote. Direct and secret. We have won 23 elections in 25 electoral processes in 20 years. So I think if President Donald Trump would inform himself a little bit more, he would erase that phrase from his speeches. And I think it would open a new vision about Venezuela. Hopefully -- hopefully that would happen. Llamas: Do you fear President Trump? Maduro: I fear the people that are around him. John Bolton, an extremist and expert of the Cold War. Elliott Abrams, a liar that trafficked arms and drugs in Central America and the world and brought war to the United States. I fear Mike Pompeo, a CIA agent that has an antiquated scheme of old intelligence from the Cold War. I fear Mike Pence, who is a man that does not know world politics, unaware of Latin American politics. I think these people surrounding President Trump and advising him on Venezuelan policies are bad. And I think that at one point, President Trump will have to say "stop, stop, we have to see what happens with Venezuela," and change his policy. Llamas: I'd like to show you something now. This was a tweet sent out by Senator Marco Rubio over the weekend. It shows Moammar Gadhafi in power, Moammar Gadhafi captured, covered in blood. (Juan Barreto/AFP/Getty Images) Venezuelans cross the Simon Bolivar brige in San Antonio del Tachira, Tachira State, Venezuela, on the border with Colombia, Feb. 20, 2019. Maduro: First, it is a horrible thing to do to any leader from any country. Everyone deserves justice and deserves respect for their rights. I believe that what they did with Libya was an act of barbarism. More than 200,000 dead, more than 20,000 air raids. And what about Libya? Tom, how is Libya worse now than ever? Divide it into four groups full of terrorist groups that handle drugs, guns, thousands and thousands of Africans leave through the Libyan ports towards Europe -- they left behind a disaster. That is the example that Marco Rubio says that we must do with Venezuela to destroy Venezuela, bomb it. I tell them no. Venezuela wants peace, and Venezuela will have peace. Llamas: Do you fear for your life? 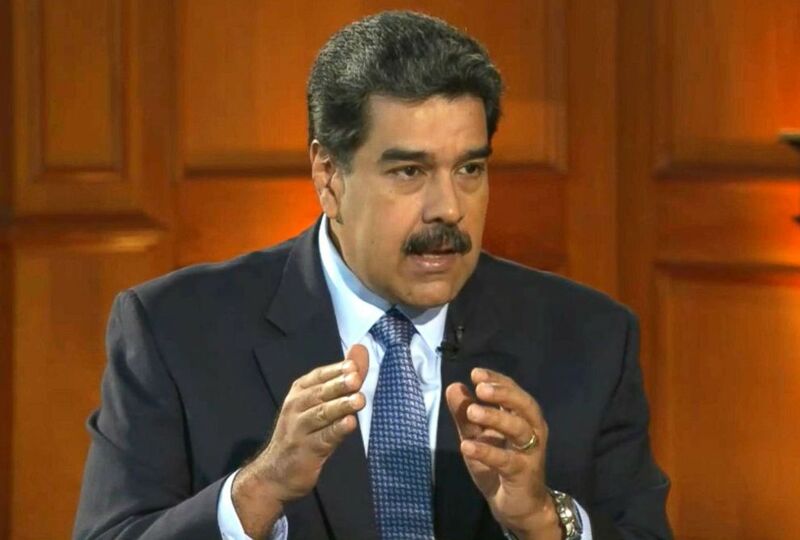 Maduro: I love my life and I think it is more courageous to live to defend the homeland. I think it is more difficult than dying defending the homeland. I am willing to live to defend my country, and I am sure that I will live. Llamas: Let's go back to this weekend. 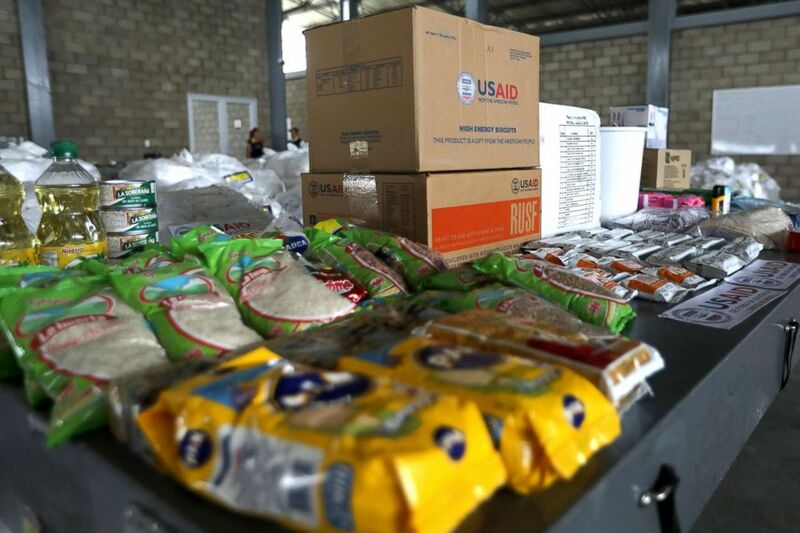 Your National Guard was able to prevent humanitarian aid coming from Colombia, coming from Brazil into Venezuela. It's a very big moment this weekend. Why is that a victory for you when people in your country are starving and they need medical supplies? Maduro: There are two components your question. What would the United States do if a caravan of trucks tried to cross the border without authorization from the relevant authorities? What would the United States do if Mexico wanted to support -- something that has not happened, nor will it -- wanted to support the forceful entry of trucks at the U.S. border? What would they do? President Donald Trump, when the migrant caravan from Honduras arrived with more than 2,000 people, he said that if they got close to the border, he was going to shoot them. That is the first thing I ask. We did what we had to do, to defend the border in peace when we had closed the border. What they were bringing in their trucks has already been shown. Those trucks had disturbance materials. There is a lot of proof of that that the support teams can show you. They wanted to put on a show around a group of trucks. That in the best of cases, Tom, had food that did not pass sanitary authorities. What would the United States do? Allow any kind of food, any kind of medicine? What the United States wanted to do was to escalate with violence to justify subsequent military threats. Llamas: But you are accepting humanitarian aid from China from Russia, you say. Why not accept the humanitarian aid from the United States? Maduro: Look, I can tell you that Venezuela, despite its difficulties, is much, much better than most of the countries that have right-wing governments that critique us. We are much better than Honduras, than Colombia, than Peru, than Ecuador. The international U.N. indexes in relations to the social investment, social equality, health, education, housing, employment, security are the highest in Latin America. Do we have problems? We are going to solve them with double effort. We are ready to receive international help. The People's Republic of China will increase their assistance for medicine, for industrial tools, and food. Russia, 700 tons of medicine arrived, all of that product in some cases were paid for by them or some by us. The European Union has offered us substantial assistance for the sourcing of medicine for the country. But you should remember that we have a commercial and financial blockade by the United States government that does not allow us to import medicine and food into the country. The European Union along with the United Nations has made a serious offer, not a politicized one, and we have accepted it and we are going to coordinate it. 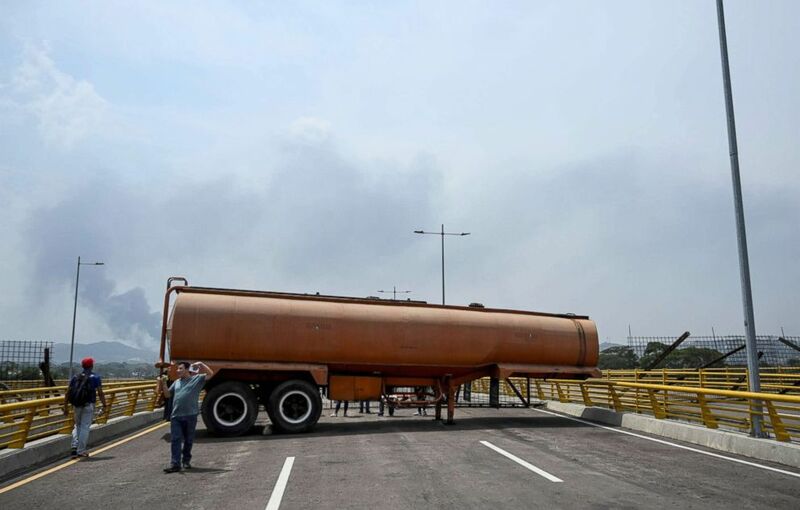 (Juan Barreto/AFP/Getty Images) Containers block the Tienditas bridge in Urena, Venezuela, on the border with Colombia, Feb. 20, 2019. Llamas: But by rejecting that aid from the United States, are you putting your pride in front of the needs of your people? Maduro: What the government of Donald Trump is sending is neither aid or humanitarian. I ask you, touch your heart like the American you are. When has Donald Trump been interested in the fate of the world? When? Has his heart been softened? If he cared a lot about the people of Latin America he should open the border's doors to the Mexicans, Hondurans, Guatemalans and Colombians that he chases from the border. He should give them workers' permits, working visas and the permanent visa to the millions of now-Americans that come from our Latin American communities. What does Donald Trump want from Venezuela? To help the people? No he wants the oil, a war for the oil, what he wants is our riches. No one should be fooled that all of this is a Hollywood show of alleged humanitarian aid that covers up the true intentions of an escalation to control and dominate our country. That is the truth. Llamas: On that point, there is a very good chance that President Trump is watching this interview right now. If he was standing in this room, right in front of you what would your message be to him? Maduro: I would tell him the same, that through direct and indirect, though private and public ways, I have said to him. President Trump, fix your policy over Venezuela. Venezuela has the right to peace, Venezuela has legitimate institutions. I, as President of Venezuela, am prepared for a direct dialogue with your government and with you to look for, like the Americans that we are. We are South Americans, you are North Americans. To look for 21st-century solutions, not Cold War solutions. The Cold War should stay behind. We cannot have this war of are you a communist, are you anti-communist, inter-communist, anti-communist -- that is not of this century. We are Democrats that believe in a new type of socialism and we have the right to the diversity of criterion and ideology. And so President Trump should always be ready to see Venezuela's truth -- the other side of the coin and rectify and start a new path. A new start with their relations with Venezuela. The path that got you here is the failed path that Barack Obama left behind, President Trump. It's a path of a coup d'etat, of an intervention -- that is not of the 21st century -- I say to you, fix it. You will always have in me someone that is prepared -- with our differences between us -- to extend my hand and talk about a peaceful dialogue. Llamas: You are saying you would like to shake President Trump's hand, you would like to speak to him. Possibly a summit? Maduro: Summit, however he wants. If it is about Venezuela's peace, our region's peace, of the development of our nation and friendly relations with the United States, I would be willing to go where ever I would have to go. To shake President Trump's hand, always with respect. We have big ideological differences -- very big, well the people that have big differences -- at this hour, President Trump should be arriving in Vietnam. Remember the Vietnam War? The United States went 14,000 kilometers from their border to a disastrous war that went on for more than a decade, and now they have good relations with Vietnam. And why did Donald Trump go to Vietnam? To shake Kim Jong Un's hand, president of the Democratic People's Republic of Korea, North Korea. So they are signs that I think point to the 21st century. And in Venezuela, their advisers, that group that we have denounced has boxed in Donald Trump's Venezuela policy to a failed Cold War schemes. Llamas: Mr. President, I want to return to what happened this weekend. As Venezuelans were clashing with the National Guard, aid trucks were set on fire. You were salsa dancing on TV. Why? Maduro: Because we always do it. Because we are happy for our fight. Because we love our people. Because as we combat to defend our sovereignty, for the defense of our territorial space, in peace as our national guard fought. Our National Guard was there in peace defending the border. We had an act with more than 300,000 people, 300,000 Caraquenians that mobilized. And when we arrived at the acts, we shared in the passion, the slogans, the yells, the salsa and it will always be like that. It has always been like that and it will continue to be like that. We are happy. 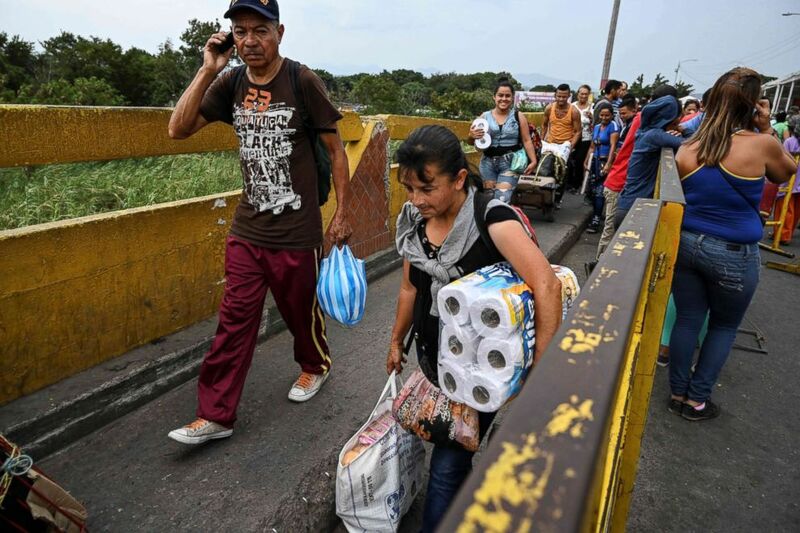 (Luisa Gonzalez/Reuters) Humanitarian aid for Venezuela is seen at a warehouse at the Tienditas cross-border bridge between Colombia and Venezuela in Cucuta, Colombia, Feb. 18, 2019. Llamas: But what kind of message does that send your people? Some of your people are starving. They need aid. They are fighting with the National Guard, and you're dancing on television. Maduro: Venezuelans -- we are 30 million -- the 30 million were in the streets, at their workplaces. It was Saturday, at the popular markets. The 30 million were in peace. The virtual reality is what they are trying to fabricate on global television. A small group of delinquents protected by the Colombian government would attack the National Guard. A group that wasn't bigger than 200 people. Criminals, delinquents. It was a specific action that was attended to and was resolved. That does not symbolize Venezuela. Venezuela is a lot bigger than a group of delinquents or a group of criminals. Venezuela, on Saturday, Feb. 23, was in peace. Sunday the 24th, it woke up in peace and today the people are in peace, working. You can go through the streets, you will see problems like any other part of the world. But you will see a lot of other things that they would tell you that Venezuela is in peace and tranquility and that the Venezuelan people want peace and not an American invasion. Llamas: We at ABC News have been covering Venezuela for years. We have seen people eating out of the trash in Caracas. People who said years ago that they did not have to eat from the streets. Your own university says that on average, the average Venezuelan has lost 24 pounds. The opposition says you are to blame. Maduro: I can go to New York, and I have walked in New York. You can go to Chicago or Boston. You can go to the streets of Los Angeles or its suburbs and you would see thousands of people, Tom, in Miami, living in the streets, freezing. The United States has 40 million poor people, and why is it not seen on TV? The 40 million people without any type of social security or healthcare. The 40 million people who sleep where they can -- if they have a car they sleep in the car. They don't have a household. And why is that type of poverty that is generated by the strongest country in the world not seen? Oh, because they come to put on a show, Hollywood style. Scene one, show someone eating in Venezuela from the garbage. I can tell you in Venezuela we have the strongest social services system in the region. And it is recognized by international organizations. It is recognized by international organizations that Venezuela has dropped its extreme poverty and misery to 4.4 percent when it was 30 percent. How is it in Colombia? It's 30 percent. It is recognized by international organizations that we have lowered poverty in general from 70 percent to 18 percent. It is a grand fight. We are advancing, but it is not good to not see the spike in one's own eye. Look at the spike that is in the eye of the United States. The immense poverty and how people die in snowstorms, they are frozen to death, and they aren't even a name at a morgue's front door. Look at your reality, you have more poverty than us. (ABC News) Nicolas Maduro is pictured during an interview with ABC News on Feb. 25, 2019, in this image made from video. Llamas: You say that you're a country of peace, but the U.N. and human rights groups estimate hundreds of people have died because of your administration. They think hundreds of people have died also since you came into power. Why are people that protest you end up either dead or in jail? Maduro: No human rights organizations has made me responsible for any deaths. You are lying, Tom. Do not lie -- you are just like Trump. You are just like Trump. Llamas: I have the report from the United Nations that says that. More than three hundred. 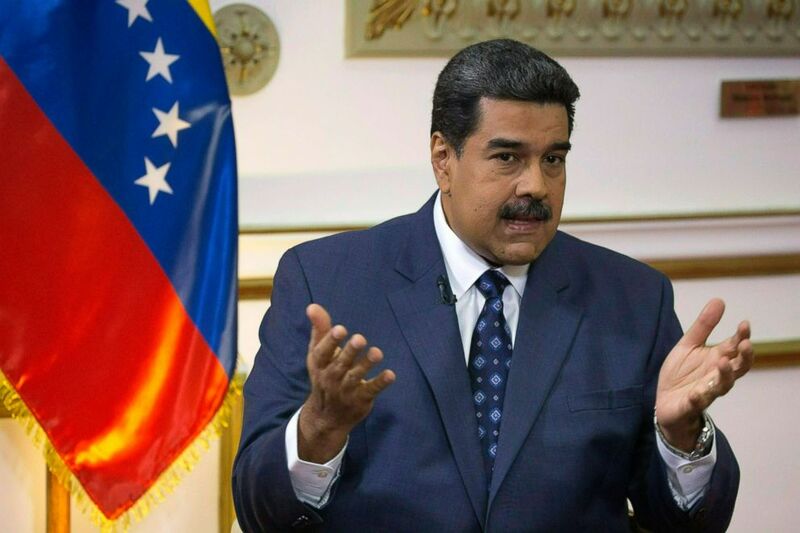 Maduro: Does it make me, Nicolas Maduro, responsible of assassinating people? Maduro: No, no, no, you have lied, Tom. You have committed an error as a journalist. Llamas: How did those people die? It's like 500 people. Maduro: When one lies and commits an error, one has to recognize it, Tom. You have committed an error, recognize it. What I can tell you is that in Venezuela that is free expression for political opposition mobilizations. They have delinquent groups that attack public forces, and that is what we put up with in 2017. Groups of delinquents that have been tried and processed according to Venezuelan law. What I can also tell you is that in Venezuela there is full freedom of political expression, of opinion, free press. In Venezuela, there is full freedom to hold public office. The opposition holds the majority of parliament -- how did they get it if we are supposedly a dictatorship. They got it with votes, with elections. The opposition has four governors. How did they get those four governors? With the popular vote. They have mayors, etc., etc. In Venezuela, there is a democracy with a lot of power, with a lot of force. And it cannot be neglected and ignored that this constitution is the first constitution in the history of our country that was approved by referendum and has been full force and is in force today in Venezuela. Llamas: More than 50 countries call you illegitimate. People by the hundreds of thousands have taken to the streets to protest you. Many of your people are starving. They need medical supplies. People are confused, and your oil assets are being frozen by the United States, your largest trading partner. Your American critics say you have run out of moves. Checkmate! Are they right? (Ariana Cubillos/AP, FILE) Venezuela's President Nicolas Maduro speaks during an interview at Miraflores presidential palace in Caracas, Venezuela, Feb. 14, 2019. Maduro: Twenty years of saying the same thing, do you remember when a vinyl record would get scratched? It would start to repeat the same phrase. It is a scratched vinyl record. An antiquated vinyl record. Venezuela has a revolution with a powerful, united citizen military. Venezuela has all the economic capacity to get ahead and we will in this year, 2019. Venezuela has a constitution that is defended by all its institutions. It is a legitimate and powerful state. And Venezuela has extraordinary relations -- we are the president of the Organization of Non-Aligned States that groups 120 countries. We are the president of Organization of the Petroleum Exporting Countries this year. We have grand responsibilities around the world that we will continue to fulfill. So that checkmate scheme, Mike Pence can believe that. Mike Pompeo can believe that. John Bolton and Elliott Abrams can believe that. But you should not believe that because you are a young man and knows that history will continue. Llamas: I've heard you say in previous interviews, about the history of Venezuela, there was Simon Bolivar, Hugo Chavez and now Nicolas Maduro. How will history judge you? Maduro: I do not know, I am not a fortune teller. I've never said that, that first was Simon Bolívar after Hugo Chávez and Maduro, no. I am a humble worker, Tom, so that you can see what Venezuelan democracy is like with a labor worker. I am not a tycoon, I am not a millionaire, I am not representative of any lobby -- a worker on foot, a man from the streets, from the barrios, president of the country by popular vote so that you can see the power of Venezuelan democracy. That is how Bolivar, our founding father, our liberator, was. The greatest man in this American continent of all history. If Hugo Chávez was a great revolutionary recognized by millions in the world. I, Nicolas Maduro, am fulfilling my task. It's still too early to assess. I'm going to be the one who's going to go through with this whole story. It's too early. What I can tell you is that it does depend on me. I will never surrender, I would never betray our people, I will be loyal to our people in all circumstances, and, in the end, I will be rewarded with victory. I am sure of that. I am a very religious man. Tom, I do not know if you are a believer in God. I am a believer in God -- God the creator. I am a strong believer in the strength of Jesus Christ the Redeemer, Jesus of Nazareth. And always, before I take any action, I pray and I seek a blessing from God for truth. What is the pure truth? Pure for the battle ahead. I am, I say, I carry with me David's sling. You remember David against Goliath. I am being attacked by all the media. And my country is being attacked by the most powerful force that has ever been known in history. They want to swallow us. They haven't been able to because we are real. They want our oil, they want our wealth, this is and oil war. Do not let that happen. You're a young American, don't let Americans start a war in South America. In the meantime, we're going to be here working, producing, improving our affair, attending our issues and if the elite that governs the United States wants to give some humanitarian aid, they should give it to the 40 million poor people who are suffering in the United States without housing, without health and social security and without work. Llamas: One last question – last one. Are you prepared to call for presidential elections? Maduro: We are always prepared. We have had 25 presidential elections in 20 years - a world record. We won 23. Now I tell you, the presidential elections were held on May 20th last year. I won with 68% - constitutionally, legally with more than 200 international observers. In Venezuela, the presidential elections of the parliament are pending in the electoral calendar. We are prepared. I would even like an agreement with the opposition to advance the parliamentary elections and that the whole world comes if they want to observe the elections. And you will see the kind of choice that the Venezuelan people will give; obtaining our 24th victory - for the revolutionaries. Llamas: Do you think you would win a presidential election today? Maduro: I won one 10 months ago. All the polling shows that our forces would be in the majority in an election. Llamas: Against Guaido as well? If Guaido were a candidate? 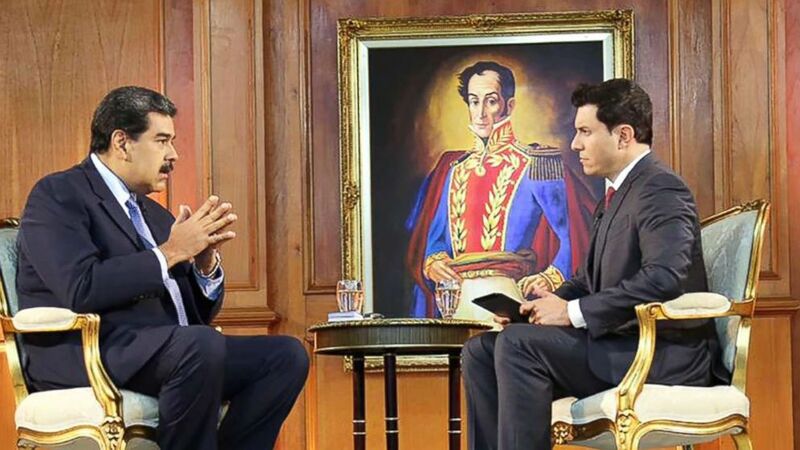 Maduro: Guaido does not exist in national politics, I can assure you. Keep observing our national politics, keep observing it. He is a puppet that is in place by Washington. There are leaders of the opposition, the opposition has its party, its leaders. And he is not necessarily the leader of the Venezuelan opposition. Llamas: Why do you call him a clown? Maduro: Because he is a clown. Imagine it -- a powerful government says that another American, other than of Donald Trump is the president. That they say Pedro Perez X is the president. And he starts to act like he was the president and calls for an American invasion or a statement to the country. How can you categorize that someone? Can we call him a political statesman? Like a serious politician? Like a politician of the future? No. Simply a puppet, a clown. He is making a fool of his own country, and, truthfully, it is hurtful when Venezuela has the liberty to do politics, to grow a force and who knows if one day they win a presidential election. If they did that, we would hand over power without any problems. But they don't think about the future. They only think about their own interests, in their resources. It is regrettable. Llamas: Mr. President, thank you for your time. Maduro: Thank you for your questions.